UKMedix provides genuine and authentic medication from trusted and respected pharmaceutical brands from around the world. We're able to provide only those medications with documented successful performance in the treatment of different conditions. We provide only genuine Femodette from Bayer and hardly an ineffective substitute while ensuring that you receive the medical advice you need in your treatment process. Through our web consultation form we'll ask all the right questions required by our medical team to understand your need for contraceptives to know more about your requirements so that the best possible prescription that meets your needs can be provided. Don't forget that we've a team of professional doctors ready to help you with any advice and medical help free of charge, confidentially and of course, without obligation. Femodette is a contraceptive pill for women containing two unique and active ingredients, namely gestodene and ethinylestradiol. These two active ingredients are essentially synthetic representations of female hormones naturally found in the body. 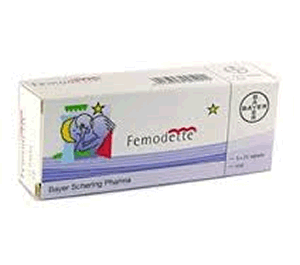 In contrast with other combined and regular contraceptive pills, Femodette contains oestrogen in very low doses. This ensures that the risk of side effects related to oestrogen is very low and also a good option for a specific number of women who need a safe contraceptive method in contrast with the mainstream combined pill used by many. When it comes to contraceptive pills the effectiveness is related to the way you use them. For instance, Femodette is 99 percent effective when you use it correctly and as prescribed by your doctor. This is why we always recommend that you follow the information given on the medication leaflet that will be provided with your treatment. What About Other Medicines and Femodette? There're a number of prescription medications and others that reduce Femodette effectiveness. As a result, you might want to let the team of doctors at UKMedix know all about all the medication you're using, used in the recent past or intending to start taking. Mention all medications, including every non-prescription drugs you might have in your possession. At the same time, UKMedix medical professionals are always ready to talk with you concerning whether the Femodette pills will react with any other non-prescription or prescription medication. Always ask to ensure nothing is left to chance. Remember alternative medicines, herbal and supplements are also medicines and your doctor need to know about them. As a monophasic type of pill, each tablet of the contraceptive contains the same hormones and dosage. Every single pill should be taken daily for 21 days before going for seven days without taking any pill. Within that time you might experience a type of withdrawal bleeding that looks a lot like a normal menstrual period. Once the seven days are over, start on the next 21 day pack whether the withdrawal bleeding has stopped or not. Always strive to take the pill at a specific date every single day so that you don't forget and erode the gains you've made. Use a drink to swallow the tablets or take with or without meals. You can begin the intake of the Femodette pill on the first day when your menstruation begins. Accordingly, you will protect yourself from a possible pregnancy and another type of pregnancy prevention won't be required at the beginning, such as a condom. You can also start the pill between one and day five of your menstruation cycle devoid of the need to use another type of contraceptive as you begin. Nonetheless, those with the shortest of menstruation cycles of 23 days and below starting on the fifth day might not offer them the immediate protection against pregnancy they might be looking for. Talk with your doctor and know if you need another contraceptive method until the pill has started working for those with short menstruation cycles. Should I Purchase Femodette Online? As you search for the best oral contraceptives that works from a pharmaceutical brand trusted the world over, we understand the need to talk with a doctor who understands your needs from wherever you are. At UKMedix we've a wonderful private and fast service that lets you access medical professionalism, knowledge and experience without having to drive hundreds of miles to meet face to face. As you purchase Femodette online we request that you search for the most genuine and well regulated websites offering authentic prescription medications and have medical professionals endorsing your prescription. As such, the veracity and authenticity of the treatment is assured to help alleviate or deal with your condition. Don't forget to identify whether a site is safe and regulated to purchase Femodette from. Look for approval information from government bodies to be sure the medication you receive is safe and approved. For instance UKMedix has a barge of approval from the MHRA government site linking to the MHRA.gov.uk where the UKMedix certification information is very clear. Notice that any site availing prescription and has failed to let you see their approval and certification information is probably illegal. The medication they provide might put your health into serious risk since the drugs are unlikely to be tested or authentic. What are the Side Effects of Femodette? Note that side effects are normal in all types of medicines and Femodette does have its number of side effects as well. It doesn't mean however that you must register side effects with the usage of this pill. In case of any serious side effect or bothersome common side effect you can always talk to your doctor. We understand that as you search for the right treatment to deal with your medical condition you need all the information you can about the treatment and condition. Finding this info online and out there isn't really easy. But UKMedix medical doctors offer you a free of charge chance to speak with them and receive all the answers you might require. Note that talking to the team of medical professionals doesn't mean you're obligated and mandated to purchase the medication. The advice and extra information provided is confidential, without obligation and free of charge.